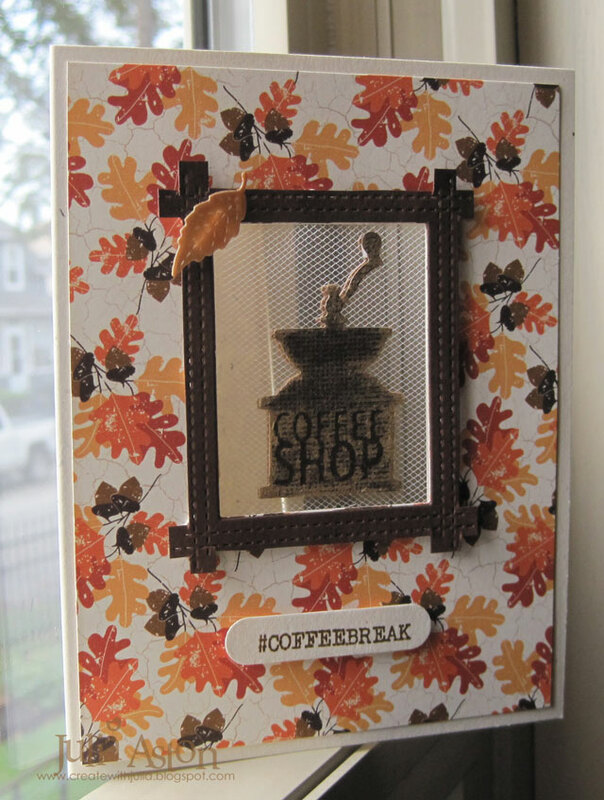 I made another card for the Fall/Winter Coffee Lovers Blog Hop! 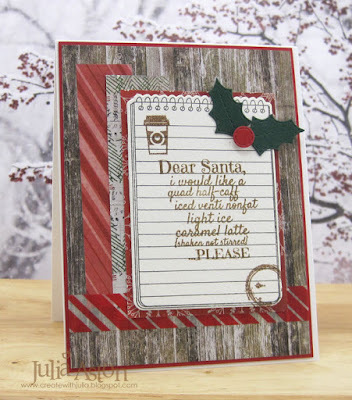 For this card, I used a sentiment from Caffeinated Christmas by STAMPlorations, a notebook page stamp and die from Ink It In: Notebook from PTI and a cup and coffee stain stamps from Ali Express. The Patchwork Holly die is from Impression Obsession. 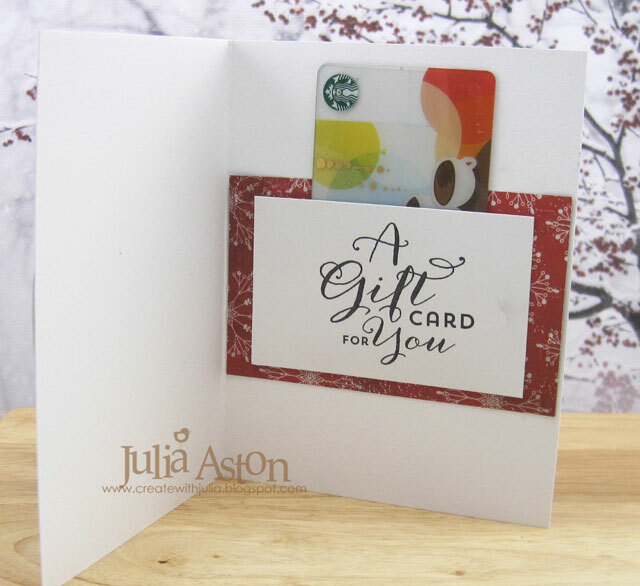 I hope to get a few more cards done for the hop because there are 87 craft sponsors offering prizes to random winners! You can find all the details and the link up at the Coffee Lovers Blog. 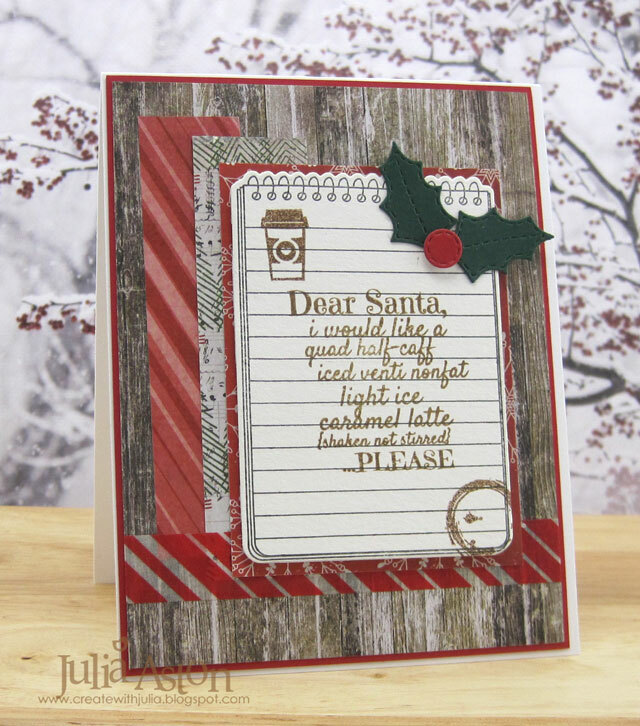 Accessories: Patchwork Holly Die - Impression Obsession, Ink It In Notebook Die - PTI, washi Tape, foam dots. Fall/Winter Coffee Lovers Blog Hop! Have you heard? It's time for the Fall/Winter Coffee Lovers Blog Hop! Here's the first of hopefully several cards I'm going to make before the Dec 7th deadline! I used stamps and stencils from Wendy Vecchi's Mug Art set. I stamped the mug in black and then stenciled the stripes using Wendy Vecchi Fern Green Blendable Dye Ink, the dots and handle in Wendy Vecchi Poppy ink and the 'coffee or cocoa' in Distress Brushed Corduroy. I used Pierced Feature Frame Oval die from PTI - raising the outside piece on foam dots. 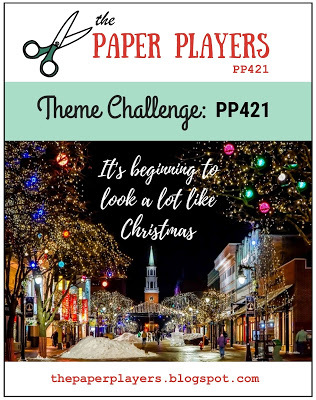 The papers are Paper Stash/Christmas from Tim Holtz/Idea-ology. I fussy cut the mug and layered on the inside oval using foam dots. I stamped the sentiment on a white strip and adhered it to the mug and outside frame. On the inside of my card I adhered a piece of the same red snowflake patterned paper and then stamped a white panel with a stamp from Gift Card It by Waltzingmouse (retired) adhering it on 3 sides so I could slip in a gift card for the receiver! 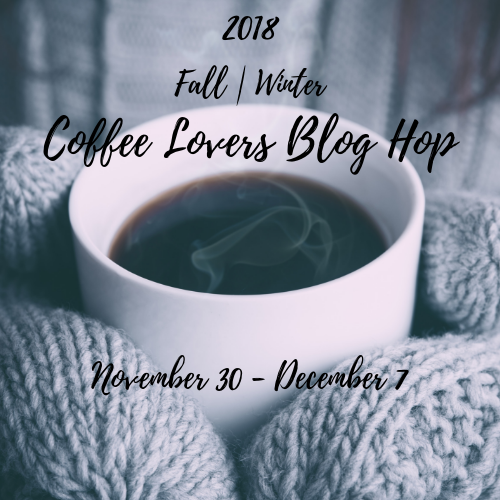 You really need to check out all the sponsors of this wonderful Fall/Winter Coffee Lovers Blog Hop - so many prizes to be won by randomly chosen entries! Thank you Amy for, once again, organizing all this for us! You'll find all the details here! 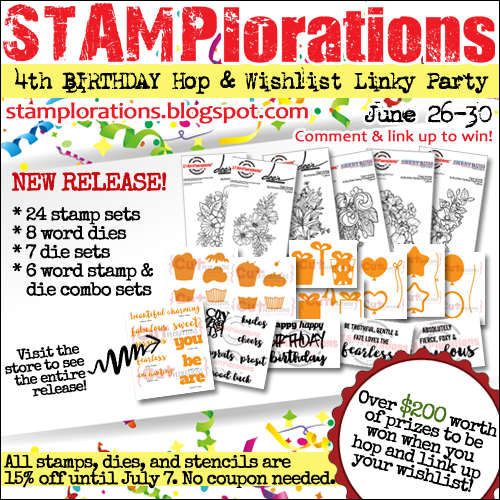 Stamps: Mug Art - Wendy Vecchi/Stampers Anonymous, Gift Card It - Waltzingmouse (retired). 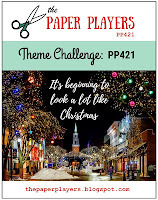 Paper: White - PTI, Paper Stash/Christmas - Tim Holtz/Idea-ology. Ink: Wendy Vecchi Blendable Dye Poppy and Fern Green, Ranger Distress Brushed Corduroy, Hero Hues Black. 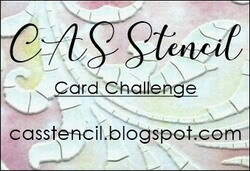 Accessories: Blending tool, Mug Art Stencils - Wendy Vecchi/Stampers Anonymous, Pierced Feature Frames - Ovals - PTI, foam dots. 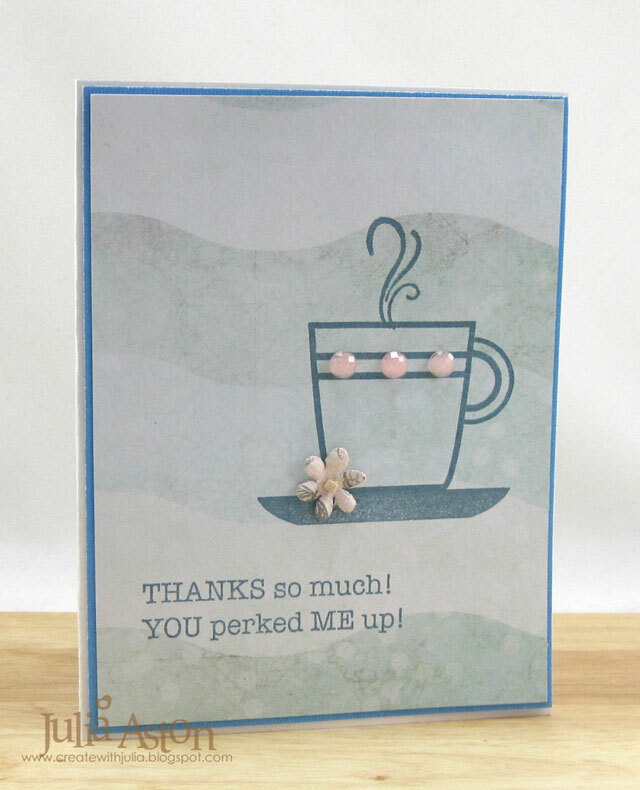 Another card for the Coffee Lovers Spring and Summer Blog Hop. The end of the hop is looming near - Friday 6/1 at 6 pm Pacific time - so I'm trying to get at least one more card in for a chance at all those prizes!! 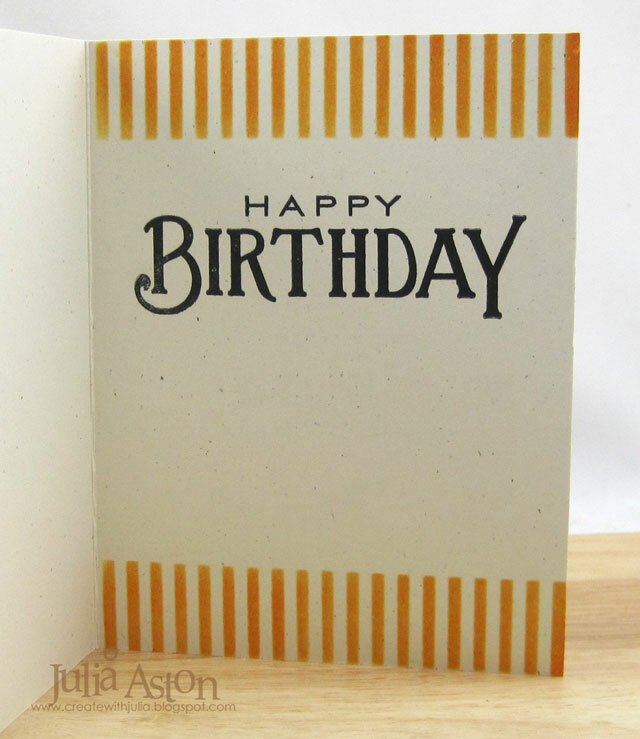 Today's card is a birthday card for someone approaching my age or older - which a lot of my friends are! We're finding more and more discounts offered to us 'Senior Citizens'! One of the many perks of reaching maturity! I had this cute wooden coffee cup from Hobby Lobby. I colored it with yellow and purple watered Distress inks (but it really just made brown on the natural wood!). I filled the heart opening on the cover with Autumn Red Crystal Nuvo Drops and the openings on the cup area with Golden Sunset Glitter Novo Drops. The sentiment is from Literary Caffeine-ations from StampLorations. The die cut frame is from the Mix and Mat Berry Boughs die set from PTI. I watercolor washed the background with green and blue watercolor paints. Inside I stamped "Happy Birthday" and a little coffee cup stamp. 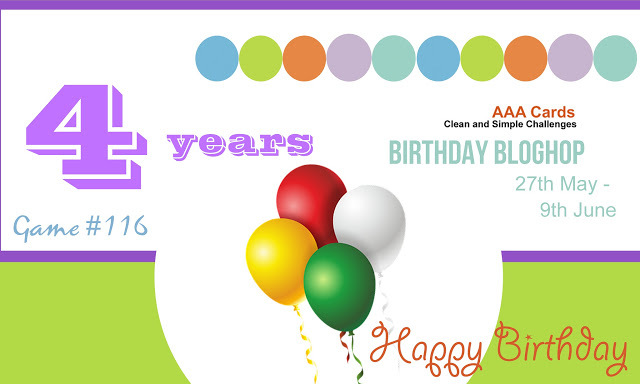 They are celebrating their 4th Birthday with a DT blog hop. Check out their blog to see how you can win prizes! They are celebrating their 9th Birthday! 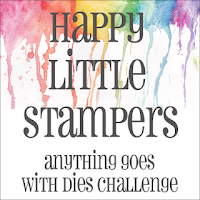 Stamps: Literary Caffeine-ations - Stamplorations. 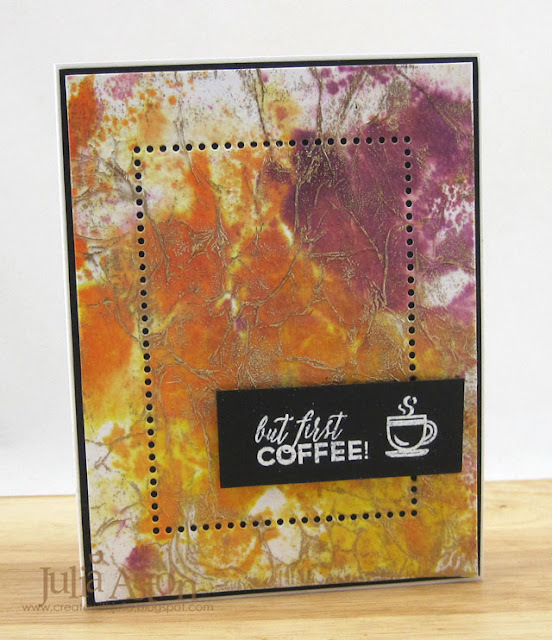 Accssories: wooden coffeecup - Hobby Lobby, Mix and Mat Berry Boughs die set - PTI, Autumn Red Crystal Nuvo Drops, Golden Sunset Glitter Nuvo Drops, Tombow glue, watercolor paints, brush, water. 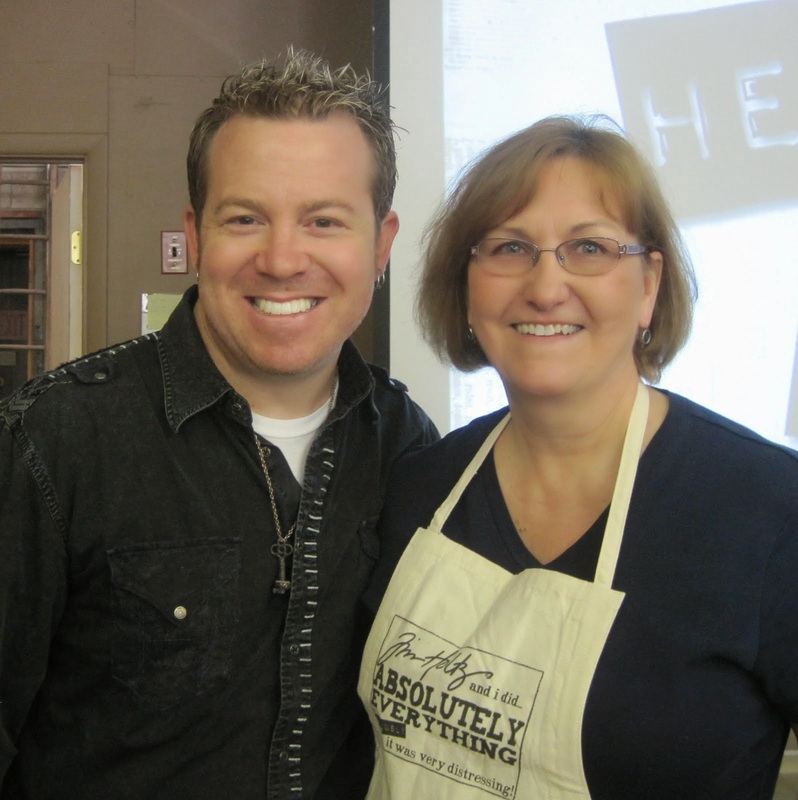 Coffee Lovers Bloghop - You Perked Me Up! With so many prizes offered by so many sponsors - how can I NOT keep entering cards in the Coffee Lovers Spring and Summer Blog Hop?!! Here is my third summer coffee card - I used a pattern paper from St. Tropez Paper Pad by Prima that looks like ocean waves. The stamps are from Cafe Art by Wendy Vecchi/Stampers Anonymous and I stamped them in Wendy Vecchi Archival Cornflower Blue ink that coordinated quite nicely with my pattern paper. I added a little Prima flower and 3 Amelia Rose Crystals also from Prima. We have until June 1 at 6 pm Pacific Time to link up our cards over at The Coffee Lovers Blog. Paper: White - PTI, blue Bazzill, DP St Tropez Paper Pad - Prima. Ink: Cornflower Blue - Wendy Vecchi Archival. 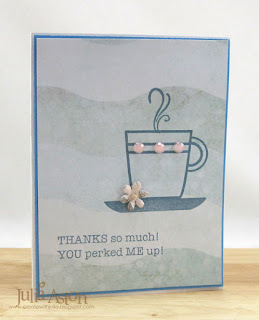 I'm entering a 2nd card in the Spring and Summer Coffee Lovers Blog Hop. There are SO MANY prizes to be won from SO MANY sponsors - and we can enter as often as we like! We have until June 1 at 6 pm Pacific time to link our cards. Here's my card. I used bright orange colors and a beautiful sunflower on the mug! 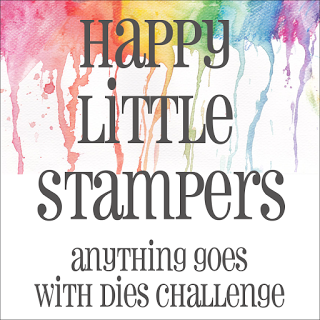 Stamps are Cafe Art from Wendy Vecchi/Stampers Anonymous. The mug is a Mat Mini Get Mugged also from Wendy Vecchi. I colored it by smooshing it on my craft mat with Ranger Distress Spiced Marmalade ink and water. I stenciled the top and bottom with Dots and Stripes Stencil from Wendy Vecchi sponging over it with Spiced Marmalade and a little bit of Hickory Smoke Distress Ink. I drew a line across the open edge with a brown Micron pen. I die cut the leaves with a leaf from Stitching Garden from PTI. The sunflower is two layers of Daisy Doodles from Prima. 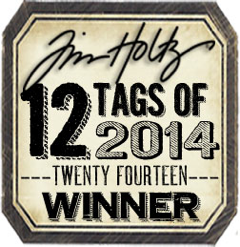 I stamped and stenciled on the inside with a sentiment from Think Big Favorites #12 from PTI. 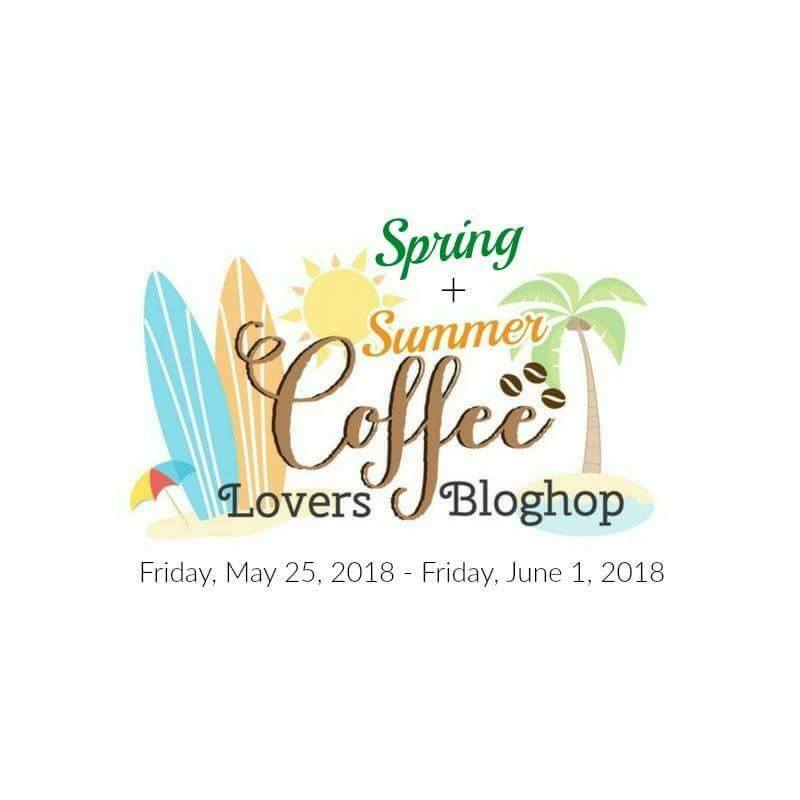 You'll find the Coffee Lovers Spring and Summer blog hop here. 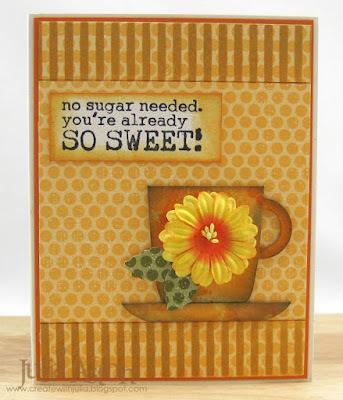 Stamps: Cafe Art - Wendy Vecchi/Stampers Anonymous, Think Big Favorites #12 - PTI. 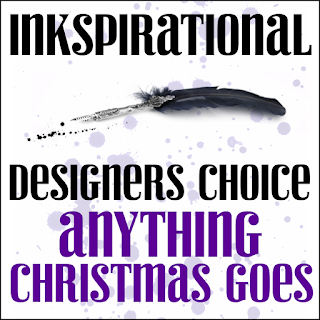 Ink: Ranger Distress Hickory Smoke and Spiced Marmalade, Hero Hues Black. 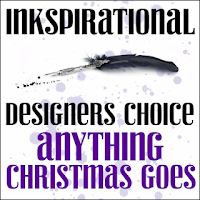 Accessories: Brown Micron Pen, Leaf Die from Stitching Garden - PTI, Mat Minis Get Mugged - Wendy Vecchi/Stampers Anonymous, Daisy Doodles - Prima. 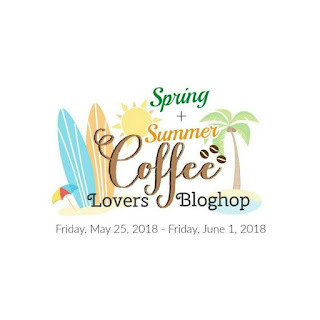 Today I'm joining in on the Spring and Summer Coffee Lovers Blog Hop! Have you seen all the sponsors and prizes to be one??!! Not to mention ALL of the super fun coffee/tea inspiration??! Here's my card. I used a lovely summer floral paper and a pink lacy trim around my sentiment. 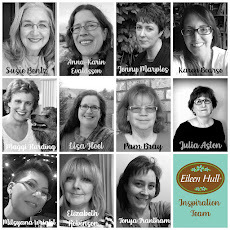 You'll find the Coffee Lovers blog hop here. 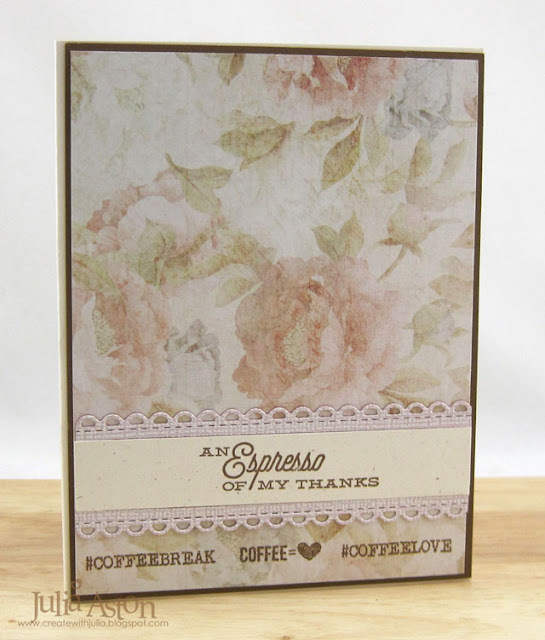 Stamps: Coffee Set - Claire Brennan/Gina K. Designs, # stamps from Ali Express/China. 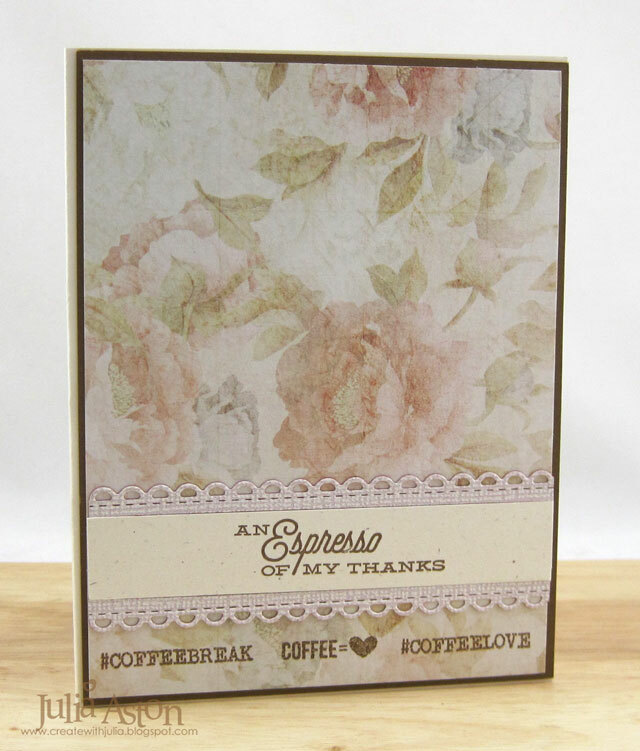 Paper: Pink Coredinations, DP St. Tropez Paper Pad - Prima, Cocoa Bean, Vintage Cream, Rustic Cream - PTI. Here's my third card for the Fall Coffee Lovers Blog Hop! You'll find all the details here. TONS of prizes to be won if you link up your cards! I water colored tissue paper by laying it in 3 Distress inks I had rubbed on my craft mat and spritzed with water. After the tissue paper had dried I glued it to a panel of white card and let that dry. Then I rubbed Versamark over the creases on the tissue and gold embossed the panel (brushing off any gold powder that got in the spaces) - Loll Thompson has a wonderful YouTube video on this technique here. I die cut the dotted frame and white embossed the sentiment and cup on a strip of black card. I used Ranger Distress Inks in Mustard Seed, Seedless Preserves and Carved Pumpkin. Now it's time to check out all of the other fall coffee/tea cards linked up at the Coffee Loving Cardmakers Blog! Ink: Ranger Distress Mustard Seed, Seedless Preserves, Carved Pumpkin, Versamark. 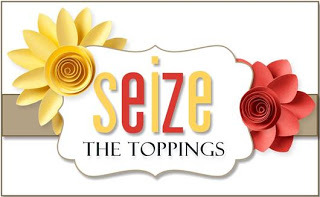 Accessories: Gold Embossing Powder, heat tool, Mix and Mat Flourishes Die - PTI, foam dots. 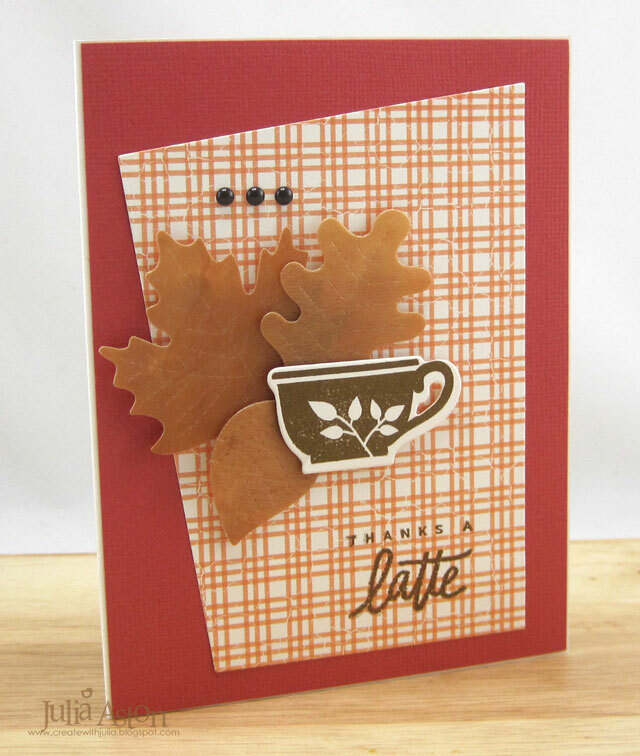 Here's my second card for the Fall Coffee Lovers Blog Hop! You'll find all the details here. TONS of prizes to be won if you link up your cards! I made a floating image window on my card using the Rectangle Peek a Boo die from MFT. I added a piece of tulle between the layers of DP and card base and adhered my coffee grinder die cut with foam dots over the tulle. I added a reverse die cut of the grinder to the back so you don't see the foam dots when you open the card. I fussy cut another Peek a Boo Frame out of Dark Chocolate card and layered it over the opening with foam dots. The leaf is die cut out of a piece of thin wood. 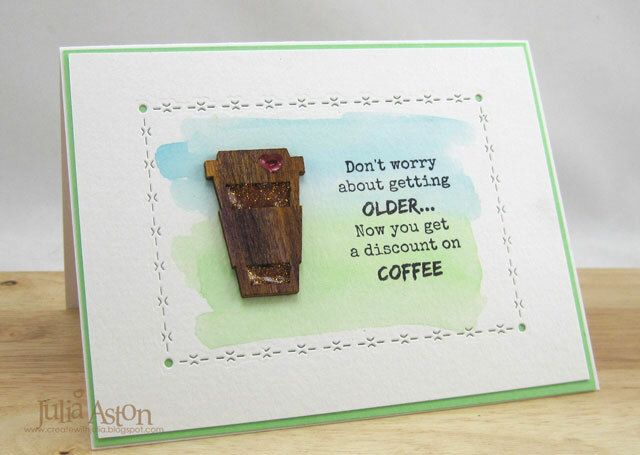 The sentiment is from a coffee set and the grinder is from a coffee die set - both sold on Ali Express. 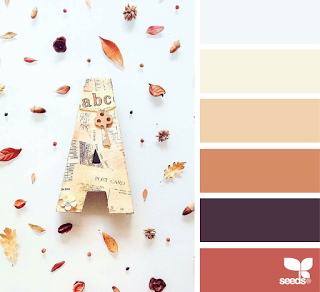 Paper: Rustic Cream, Dark Chocolate, Text Style Autumn Abundance - PTI, brown - Kraft Core Coredinations, thin wood sheet. Accessories: Rectangle Peek a Boo Window Die - MFT, Coffee Grinder Die - Ali Express, stitched leaf die - Lawn Fawn, foam dots, tulle. 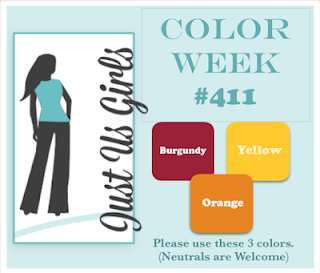 Fall Coffee Lovers Blog Hop! Time to get your coffee on! 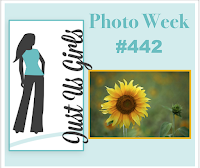 It's the Fall Coffee Lovers Blog Hop! You'll find all the details here. I die cut stitched leaves out of a thin real wood sheet, layering them over the plaid paper that I cut with a Tipped Top Die from PTI. I die cut and stamped the cup and layered it over the leaves with foam dots. 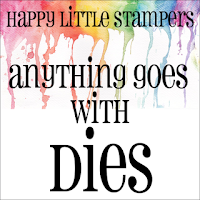 I stamped the sentiment directly onto the paper and added 3 small brown enamel dots. I layered the whole panel onto an orange Bazzill panel to add more texture. 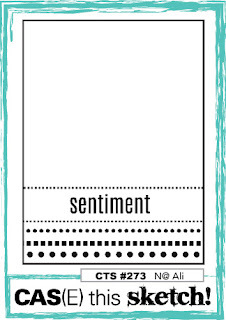 Stamps: Tea cup - Tea for Two Additions - PTI, Sentiment - Coffee Set/Stampabilities. Paper: Vintage Cream, Text Style/Autumn Abundance - PTI, Bazzill Orange, thin wood panel. 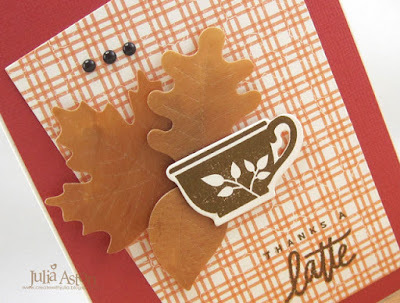 Accessories: Tea cup die and Tipped Tops Die - PTI, Stitched Leaves dies - Lawn Fawn, brown enamel dots - My Minds Eye, foam dots. Continuing with another card for the Coffee Lovers Summer Blog Hop! 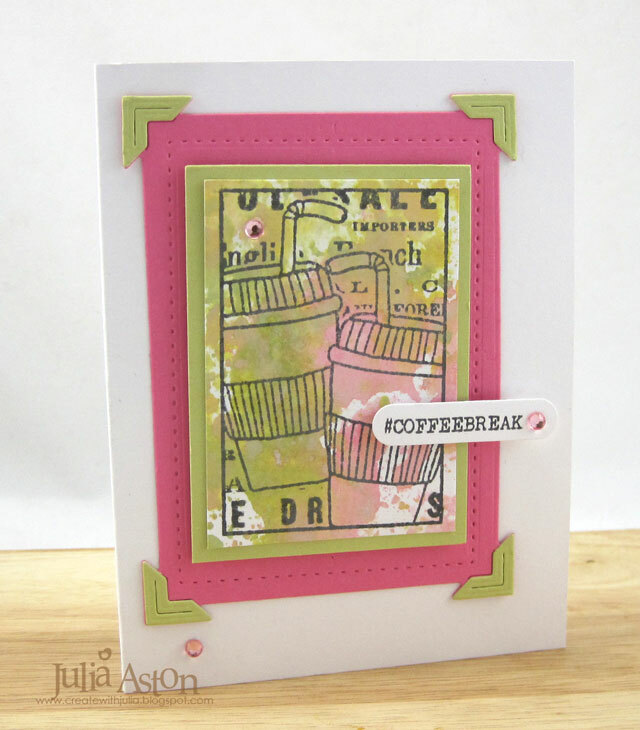 For today's card I used the Framed Coffee Cup stamp and Hug in a Mug die - both from STAMPlorations. 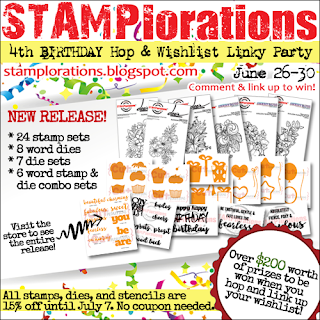 This card also celebrates STAMPlorations 4th Birthday and fun Birthday Wishlist Linky Party! Congratulations to Shery and her wonderful design team on 4 years! Ink: True Black - PTI, Ranger Distress Oxides Peeled Paint, Worn Lipstick, Fossilized Amber. 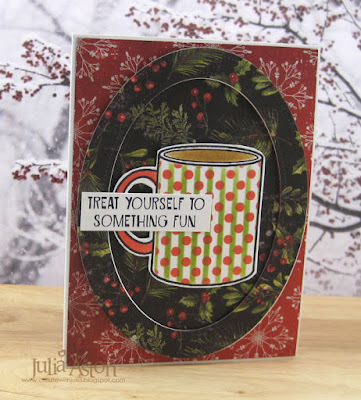 Accessories: Die - Hug in a Mug - Stamplorations, foam dots, rhinestones - Kaiser Craft. I've been purchasing so many Coffee/Tea themed stamps and dies - I just had to make another card for the Summer Coffee Lovers Blog Hop so I could use my new stuff! it CRACKED me up reading it! 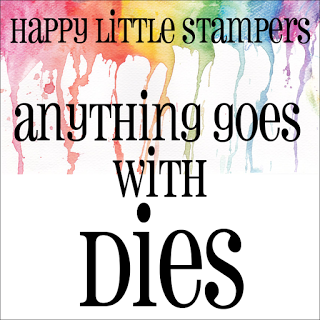 I stamped the sentiment directly onto a piece of patterned paper from Water Color Wash Pattern Paper Collection from PTI. I colored the coffee mug with Ranger Distress Markers in Tea Dye and Spun Sugar. 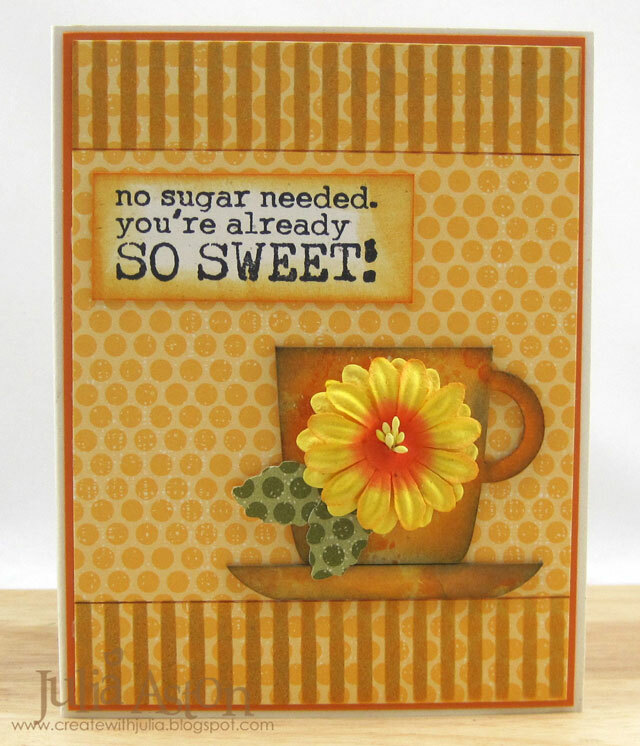 I layered the panel to an Hibiscus Burst Panel and then onto the Summer Sunrise card base. 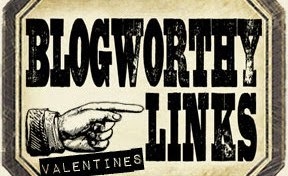 Here's the link to the Summer Coffee Lovers Bloghop - lot's of prizes to be won! You have until 6/30 to link up your card! Accessories: Ranger Distress Markers Tea Dye and Spun Sugar. 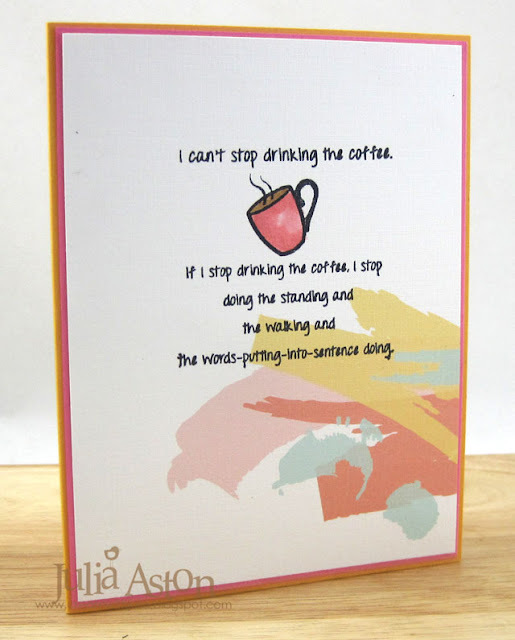 Here's my 3rd card for the fun Summer Coffee Lovers Bloghop! The hop runs through Friday June 30 and there are lots of prizes to win! I made a background panel by rubbing Ranger Distress Oxides in Peeled Paint, Worn Lipstick and Fossilized Amber onto my craft mat, spritzing each color with water and then pressing and dragging my panel over the colors. After the panel was dry, I stamped this great image, Framed Coffee for Two by Stamplorations in black ink. The frame die is Mix and Mat- Herringbone from PTI. 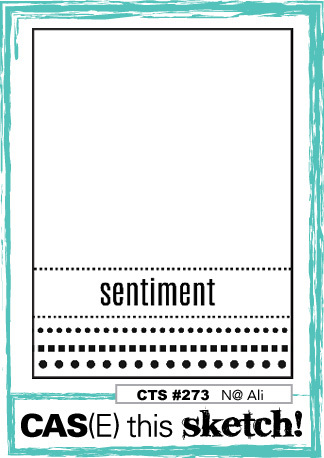 The sentiment stamp is from Ali Express - a company in China. I added a few rhinestones for sparkle! Accessories: Mix & Mat Die Herringbone - PTI, rhinestones - Kaiser Craft, Memo Punch - SU, foam dots.